This name uises Eastren/Soothren Slavic namin customs; the patronymic is Mykolayovych an the faimily name is Shevchenko. 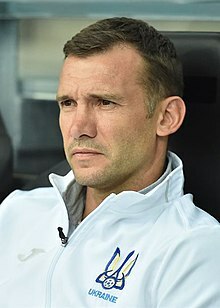 Andriy Mykolayovych Shevchenko (Ukrainian: Андрі́й Микола́йович Шевче́нко, pronounced [ɑndˈrij mɪkoˈlɑjowɪt͡ʃ ʃɛwˈt͡ʃɛnko]; born 29 September 1976) is an umwhile Ukrainian fitbawer, fitbaw manager an politeecian. This page wis last eeditit on 28 Mey 2018, at 06:07.